Charlie Sheen has hit back against the predictable establishment response to his Jimmy Kimmel Live appearance by asking why they failed to address the two core issues he mentioned, the five frames of the Pentagon footage and Building 7. Sheen accuses the media of being complicit in the 9/11 cover-up. The response to Charlie Sheen's Friday night appearance on Jimmy Kimmel Live (VIDEO) again underscores the blind ignorance of the establishment media in their treatment of the 9/11 subject as well as their blatant deception in claiming Sheen has little public support. Sheen limited his focus to just two issues, the Pentagon and Building 7. "There are two areas," said Sheen, "Building 7 and the five frames from the Pentagon. Don't listen to me, do your own research," Sheen stated on the ABC show. But every single hit piece has failed to adequately discuss either. According to recent developments in the Moussaoui trial, family members were shown video of the impact of Flight 77. Why is that footage so sensitive that it has not been released publicly? Or was the footage just a repeat of the five amorphous frames that have provoked so many questions? The National Ledger website has so relentlessly attacked Sheen that it looks like they are now doing so only to try and attract attention. Despite this, today's tirade fell flat on its face again in refusing to address the main tenets of Sheen's argument. The writer also confused Charlie Sheen with Tom Cruise, as can be seen from the screenshot below, hardly a mistake that would fill one with confidence as to their focus and journalistic credibility. 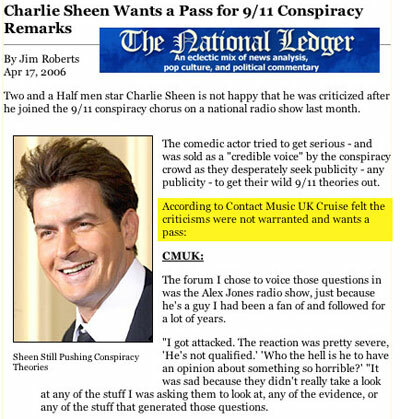 While attempting to state that Sheen is trying to come forward with a mea culpa The Ledger can't even keep straight that its Sheen not Tom Cruise who is brave enough to ask questions about 9/11. Find out the truth about 9/11! Get your Martial Law 9/11 DVD here or watch it right now online here. Furthermore, The Ledger cites the cockpit recordings of Flight 93 as evidence to debunk Sheen's claims. For a start Sheen has not even discussed Flight 93 or used it to illustrate his argument. Secondly, the Flight 93 cockpit recordings, assuming they are genuine, contradict the official contention that the 'let's roll' heroes bravely crashed the plane, preventing it from finding a higher profile target. This completely contradicts a speech made by President Bush on May 8 2002. "I think the most telling event on September 11th, and one that I hope a lot of people remember, is what happened on Flight 93. Basically, what I’m saying is, it’s important to serve something greater than yourself in life. It’s important to serve a call greater than yourself and a cause greater than yourself. Flight 93, we had average citizens flying across the country, and they realized their plane was fixing to be used as a weapon on the Nation’s Capital. They called their loved ones on the phone. They said a prayer and told them they loved them, said a prayer, and they drove the plane in the ground to serve something greater than themselves. That’s the American spirit I know. That’s that sense of sacrifice that makes this country so strong." If you believe the Flight 93 transcripts the only people who drove the plane into the ground were the hijackers. "No one cares if Charlie Sheen has questions." "But when you make outrageous claims with nothing more than propaganda to back up said claims - expect to be attacked. Other people get to speak as well - and Sheen needs to understand that." "Sheen is allowed to have his questions - and folks in the media are allowed to challenge him and indeed label him a tin foil hat wearing "Hollywood nut." He brought nothing serious to the table to debate. Quite to the contrary, Sheen asserted only (as he has ever done) that he has questions about things that "don't make sense," and wants to see more attention given to these questions that many people share. His statements during the Jimmy Kimmel interview were not a mea culpa, but a hardline stance reclaiming his right as an American citizen to question authority. Despite what many might have you believe about Sheen, the people are with him. Charlie Sheen personally gave his response to Jim Roberts' Ledger piece. "Hey Jim - Why did you so carefully yet obviously OMIT my two specific focal points, Building 7 and the 5 frames from the Pentagon, in your story, despite numerous quotes from the Kimmel piece interwoven throughout?" "Like so many others, chances are you took a look for yourself and realized the evidence is far too credible. I'm all for an honest debate. However, manipulating or distorting such irrefutable data prevents anything of the sort from occurring. There is nothing "tiny" about this movement. Do a little more research before you spew forth such blatant inaccuracies." "It's actually inspiring to witness this level of media arrogance and complicity - it so clearly illustrates a radical and baseline climate of fear. Fear perhaps, of the TRUTH... I wish you well in your travels." We will wait and see if The Ledger even publishes Sheen's rebuttal, something the Guardian refused to do. 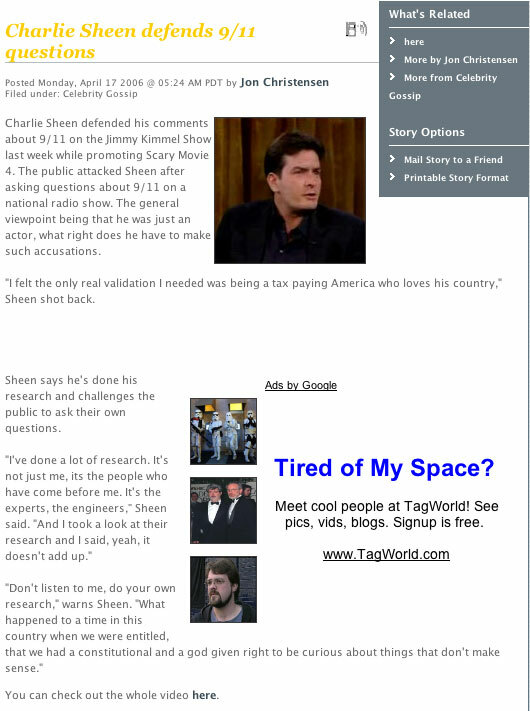 The most egregious of the spin appears on Slashfilm where the site states that, "The public attacked Sheen after asking questions about 9/11 on a national radio show. The general viewpoint being that he was just an actor, what right does he have to make such accusations." While Sheen does indicate that he was attacked for his comments during the interview, it was in fact the media that attacked his brave stance and not the public. The public's outcry, as measured by several polls conducted by CNN and others, had been very much in favor of Sheen and his willingness to put his career on the line and speak truth to power. 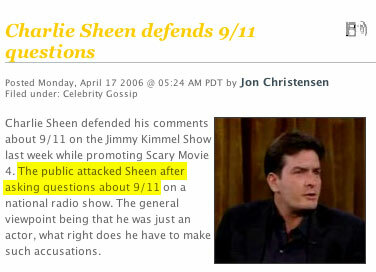 Even during the interview on the Jimmy Kimmel Live program, the crowd responded with a powerful and sustained round of applause when Sheen again raised his questions about 9/11. In an article recently published by Scripps-Howard News Service, Journalist Betsy Hart notes the incredible response she first received when covering the Sheen 9/11 story, "I started getting inundated with e-mails. They implored or demanded that I consider Sheen's "evidence" of a government conspiracy." This is a cheap attempt to skew the incredible, positive response from people all over the country who viewed Sheen's statements on 9/11 as a courageous and important act. Far from becoming a shrinking violet, Charlie Sheen has now gone one step further in his defiant stance on 9/11. After the media failed to respond to his invitation to challenge him on the facts, he is now pointing a finger at the media for collaborating in the cover-up of 9/11. "The mainstream media's blatant attempt to suffocate and censor my specific points of interest i.e. Building 7 and the five frames from the Pentagon, illustrates their transparent and desperate role as accomplices to the 9/11 cover up," Sheen told Alex Jones. Proof of this censorship has again come from Google's quarters, following their refusal to index any articles concerning Sheen's appearance on The Alex Jones Show, a policy that was later reversed, we have again run into a black hole in terms of Google's failure to index Infowars or Prison Planet articles concerning Sheen's appearance on Kimmel (listing only a temporary cache of our main index pages). Will Google continue to impose a blackout or, as in other cases, will they relent under pressure? Will the mainstream attack dogs continue to whimper like poodles or will they actually engage Sheen in a real debate? Watch Every Alex Jones Documentary For Just $5.95! Click Here.